It was a late summer’s day in September, and the shops were already filling their shelves with Christmas goodies. And who can blame them, it was only three whole months until the big day after all. Billy and I found ourselves heading to Cardiff, to another place where Christmas had arrived early. For the first time since the completion of the Series 8 title sequence, we were on our way back to the BBC studios in Roath Lock. Arranged for us by Doctor Who’s Post Production Supervisor, the delightful Nerys Davies, we were to spend the day with the equally delightful Edward (don’t call me Ed) Russell, Doctor Who’s Brand Manager. To my delight, I soon discovered that Edward was as big a fanboy as me. Billy could only look on bemused as we discussed whether Robot of Sherwood was more akin to The Android Invasion or The Androids of Tara. Tara all the way for me. Our tour began on a snowy rooftop currently under construction. Edward introduced it as Clara’s roof, something we got to see in action for the first time in the Children in Need preview clip. I noticed a particularly out of place dvd copy of Brokeback Mountain lying innocently on the roof. For a moment my mind wandered as I imagined the outrage when it came to light that this was Steven Moffat’s inspiration for the Christmas storyline. It’s more Alien meets Miracle on 34th Street explained Edward. Maybe next year. We next happened upon a large round structure, and we ventured inside. 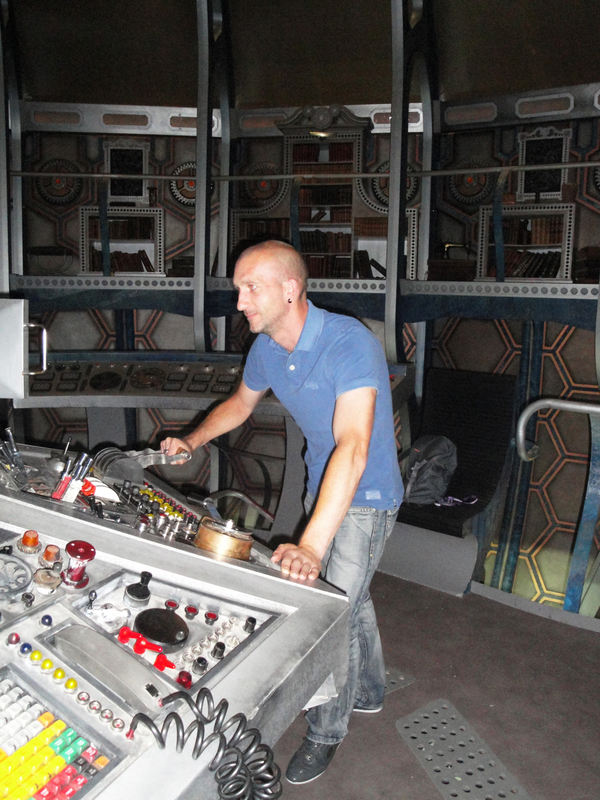 A lifetime of childhood dreams suddenly came true as we found ourselves in the TARDIS. And its actually smaller on the inside, its amazing what some cleverly placed camera angles can do. We explored the upper level book shelves and the lower level workshop, but it was the console to which we were both drawn. Billy couldn’t help but have a feel of the telepathic goo Clara got to grips with in Listen, and I just had to pull that infamous lever (see attached photo of me living the fanboy dream). Our next stop was to watch some filming taking place. They were doing green screen stuff, and we found ourselves in a control room that Edward explained was only just recently an Arctic base. The crew were most welcoming, we were given headsets so we could hear what was being said on the studio floor as we watched the action on monitors. I can’t go into the details here, as I’m writing this before the Christmas episode airs, but Peter Capaldi and Jenna Coleman were both there, as was Nick Frost’s Santa. The scene is from late on in the episode, and we gleaned a few spoilers that I couldn’t possibly divulge here. We also learned that guest cast can be hilariously potty-mouthed between takes. Edward was fantastic at explaining what was going on and why things were being done in a certain way. To my disappointment he was also fantastic at deflecting any attempts I made to get hold of any more spoilers. He teased us by asking who we thought Missy was, and sat poker faced as I rambled my various theories. He even suggested that she may be an entirely new character to throw me off the scent completely, the little rascal. Lunch was called, and Edward steered us towards the door the cast would emerge from. This was our chance to get a quick hello with the stars. Jenna Coleman smiled at us and said hello as she studied her mobile, and true to form Billy walked straight into guest star Natalie Gumede. “Don’t worry about it love,” she said, laughing. We spotted Peter Capaldi emerging, and Edward called him across. We were introduced, and Peter enthusiastically shook our hands. We were pleased to learn that he loved the new title sequence, otherwise things may have been a little awkward! We chatted for a few minutes, Peter was keen to learn about our work and future plans. I also managed to connect with his inner fanboy, as conversation somehow turned to the costume design in 1970s Who. I’m sorry, I can’t help it. 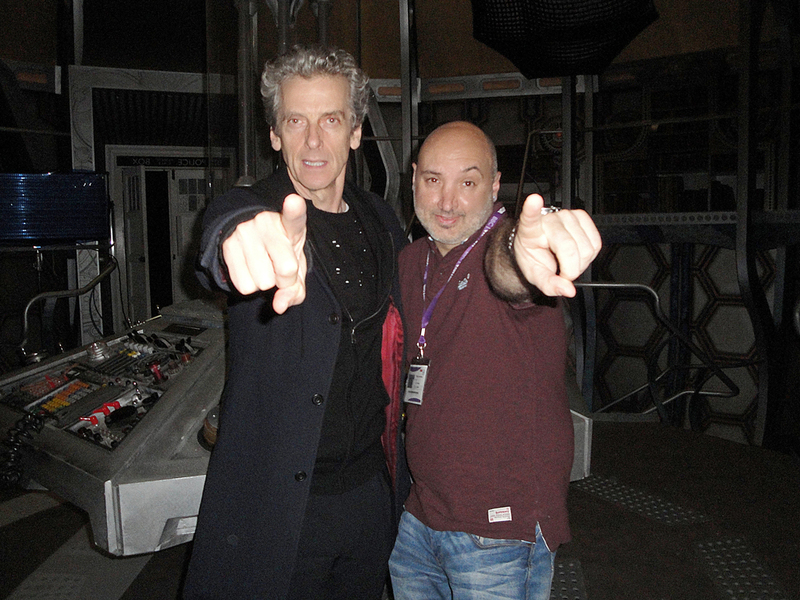 To our delight, Peter suggested we head to his TARDIS for some photos. 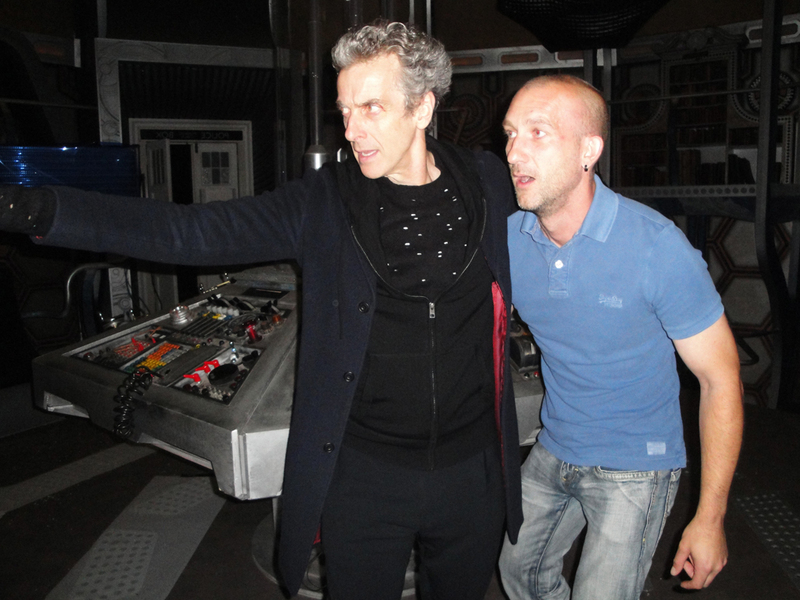 Edward did the honours with the camera as we stood with the new Doctor in his console room. I even got to reproduce the classic Jon Pertwee/Katy Manning pose, as Peter pointed at a distant threat and I looked on horrified. Katy had been on set just a few days earlier, as she was filming a guest spot for Casualty in the studio next door. Edward told Peter that the next day original companion Carole Ann Ford was to make a visit, prompting Peter to wonder if his Doctor could ever go back and visit his grand daughter in the show. I cheekily asked Peter for an autograph, Edward joked that Peter will no doubt be asking the same of Carole tomorrow. 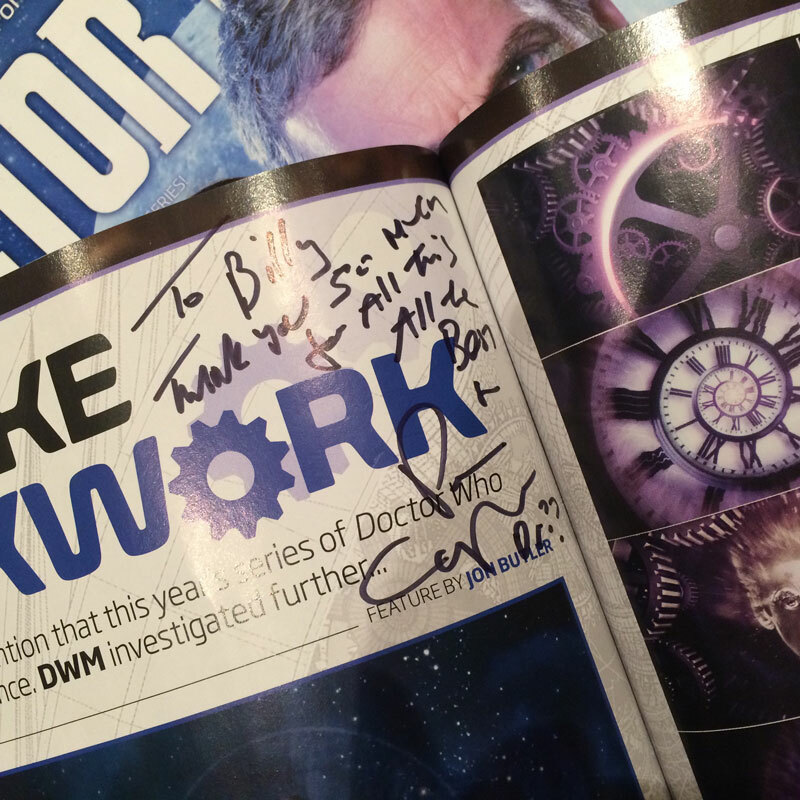 Peter wrote a lovely thank you message to Billy on the article about the title sequence in a copy of Doctor Who Magazine. Then, having given up half his lunch break to spend time with us, Peter headed off, but not before asking us to go back to the other set and watch some more filming. Which of course we did. 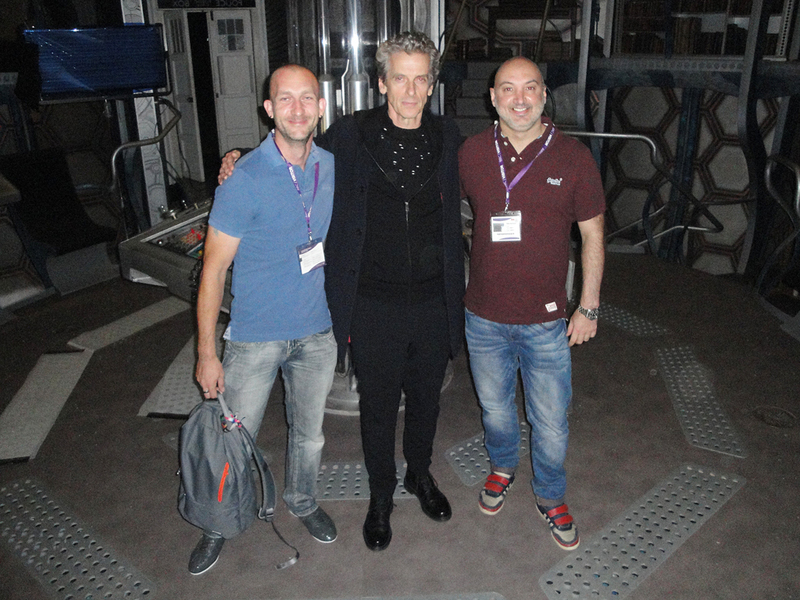 Billy and I would like to extend our gratitude to Nerys and Edward for organising our visit, to the cast and crew for their hospitality, and especially to Mr. Peter Capaldi for being so generous with his time. A wonderful Doctor and a wonderful man.